10 Panel Drug Test is competitive binding, lateral flow immunochromatographic assay for qualitative and simultaneous detection of Amphetamine, Oxazepam, Cocaine, Cannabinoids, Methamphetamine, Morphine, Oxycodone, EDDP, Secobarbital, Buprenorphine, Methylenedioxymethamphetamine, Phencyclidine, Propoxyphene , Nortriptyline and Methadone in human urine. 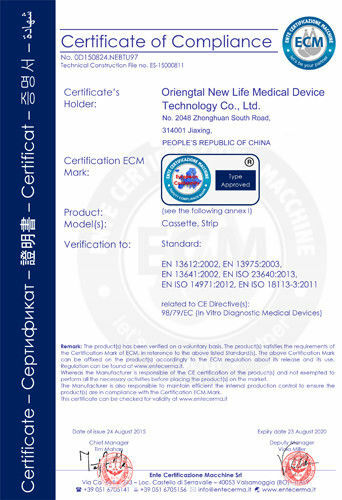 If refrigerated, allow the test device to come to room temperature, 59-86°F (15-30°C) prior to testing. 1) Remove the Clarity Multi-Drug Urine Test Dip Card from the foil wrapper. 2) Fill a specimen cup (not provided) with fresh urine. 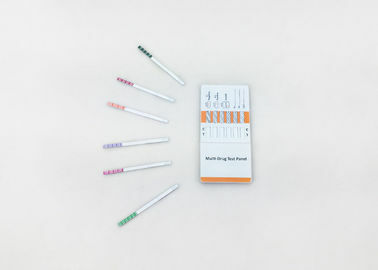 Dip the Clarity Multi-Drug Urine Test Dip Card into the urine with the arrow end pointing toward the urine. Do not cover the urine over the MAX (maximum) line. You may leave the Clarity Multi-Drug Urine Test Dip Card in the urine or you may take the Dip Card out after a minimum of 15 seconds in the urine and lay the Dip Card flat on a non-absorptive clean surface. 3) Read results at 5 minutes and do not throw away the urine. Urine used may be needed for confirmation testing. 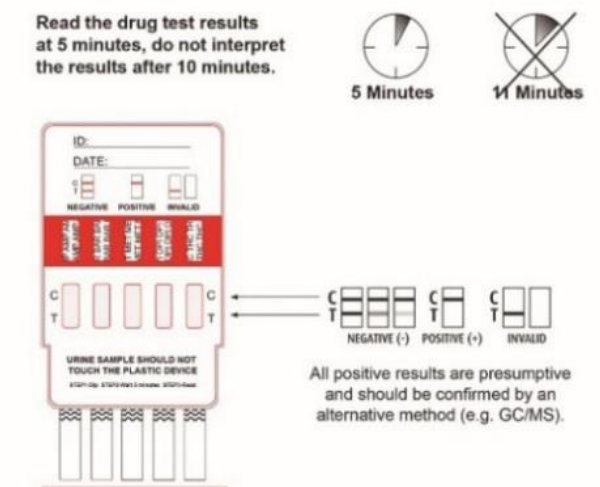 The test is intended for use as the process to provide health care professionals and consumers with information concerning the presence or absence of the above stated drugs in a urine sample. in the urine as amphetamine and oxidized and delaminated derivatives. However, 10-20% of Methamphetamine is excreted unchanged. Thus, the presence of the parent compound in the urine indicates Methamphetamine use. COCAINE(COC) Cocaine is a potent central nervous system(CNS) stimulant and a local anesthetic. Initially, it brings about extreme energy and restlessness while gradually resulting in tremors, over-sensitivity and spasms. In large amounts, cocaine causes fever, unresponsiveness, difficulty in breathing and unconsciousness. Opiate(OPI) Opiate refers to any drug that is derived from the opium poppy, including the natural products, morphine and codeine, and the semi-synthetic drugs such as heroin. Opioid is more general, referring to any drug that acts on the opioid receptor. Opioid analgesics comprise a large group of substances which control pain by depressing the central nervous system. Large doses of morphine can produce higher tolerance levels, physiological dependency in users, and may lead to substance abuse. Morphine is excreted unmetabolized, and is also the major metabolic product of codeine and heroin. Morphine is detectable in the urine for several days after an opiate dose. MARIJUANA(THC) THC ( 9--tetrahydrocannabinol) is the primary active ingredient in cannabinoids (marijuana). When smoked or orally administered, it produces euphoric effects. Users have impaired short term memory and slowed learning.They may alsoexperience transient episodes of confusion and anxiety. Long term relatively heavy use may be associated with behavioral disorders. The peak effect of smoking marijuana occurs in 20-30 minutes and the duration is 90-120 minutes after one cigarette. Elevated levels of urinary metabolites are found within hours of exposure and remain detectable for 3-10 days after smoking. The main metabolite excreted in the urine is 11-nor- 9-tetrahydrocannabinol-9-carboxylic acid ( 9-THC-COOH). BENZODIAZEPINES(BZO) Benzodiazepines are medications that are frequently prescribed for the symptomatic treatment of anxiety and sleep disorders. They produce their effects via specific receptors involving a neurochemical called gamma aminobutyric acid (GABA). Becausethey are safer and more effective, Benzodiazepines have replaced barbiturates in the treatment of both anxiety and insomnia. Benzodiazepines are also used as sedatives before some surgical and medical procedures, and for the treatment of seizure disorders and alcohol withdrawal. Risk of physical dependence increases if Benzodiazepines are taken regularly (e.g., daily) for more than a few months, especially at higher than normal doses. Stopping abruptly can bring on such symptoms as trouble sleeping, gastrointestinal upset, feeling unwell, loss of appetite, sweating, trembling, weakness, anxiety and changes in perception. Only trace amounts (less than 1%) of most Benzodiazepines are excreted unaltered in the urine; most of the concentration in urine is conjugated drug. The detection period for the Benzodiazepines in the urine is 3-7days. NEGATIVE:* A colored line appears in the Control region (C) and colored lines appears in the Test region (T). This negative result means that the concentrations in the urine sample are below the designated cut-off levels for a particular drug tested. *NOTE: The shade of the colored lines(s) in the Test region (T) may vary. The result should be considered negative whenever there is even a faint line. POSITIVE: A colored line appears in the Control region (C) and NO line appears in the Test region (T). 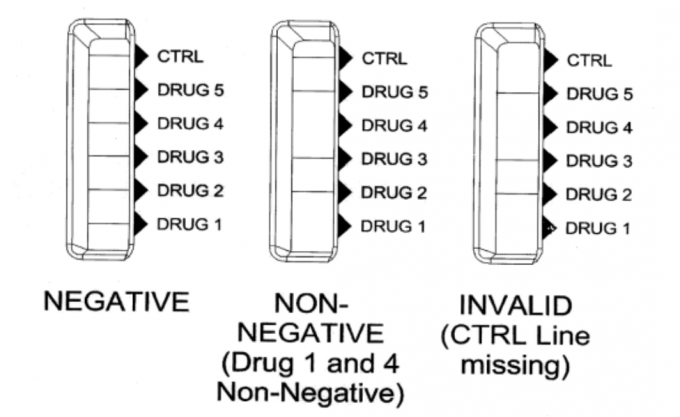 The positive result means that the drug concentration in the urine sample is greater than the designated cut-off for a specific drug. INVALID: No line appears in the Control region (C). Insufficient specimen volume or incorrect procedural techniques are the most likely reasons for Control line failure. Read the directions again and repeat the test with a new test card. 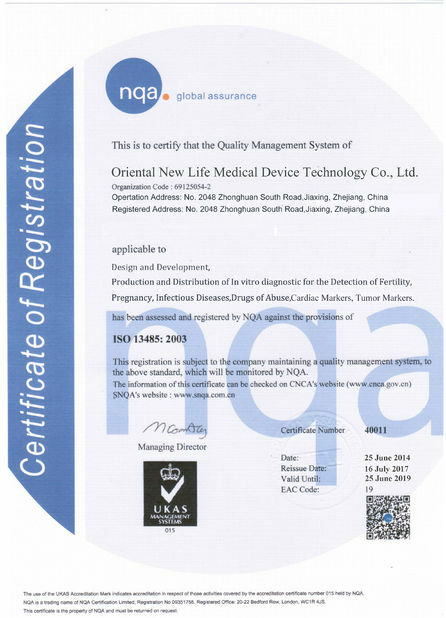 If the result is still invalid, contact your manufacturer. If you work in a laboratory, you should perform quality control testing and you should read this section.